If you are under the impression that ATVs are only for adults then you’re in for a surprise. Electric ATVs designed for younger audiences certainly do exist and allow children to experience the thrill of off-road adventure in comfort and style. Below I have compiled a list of the five best electric four-wheelers that will easily satisfy the need for speed that your kids may have. Bicycles and other vehicles are great for the sidewalks around the neighborhood but if you have a child in your life looking for a little more excitement, then a kids ATV is the way to go. There are a few things to keep in mind when choosing an electric ATV. If you’ve never purchased one before then have no fear. This section will act as a little primer on how to watch out for what makes an electric quad a great fit for kids. The first thing you’ll want to pay attention to is the size. Electric quads designed for youth are much smaller than the normal sized ones that adults use. You still want to make sure that things like the recommended age size and the maximum weight capacity will fit the child you have in mind. Safety is another big factor, arguably the biggest one. We all want an electric ATV to provide the safest ride possible if our kids are using it. This is accomplished by having a smooth and comfortable riding experience on various terrains. Being able to go into reverse and having a responsive braking system is also a big plus. These tie into safety and comfort but you’re definitely going to want to purchase a ride that will be fast enough for the child you have in mind. You don’t want something so slow that it would only appeal to someone half their age. On the other hand, you don’t want something that’s too fast, otherwise, you’ll be giving yourself a panic attack each time your boy or girl goes into top gear. There are a few miscellaneous features I watch out for that I hope electric quads will have. These are the kinds of extra functions that serve to enhance the experience for the kid riding. A good color and paint job, big, realistic wheels, and lights all go a long way to completing the satisfaction for a child. With that said, let’s take a look at what I consider the top five overall best electric quads and ATVs for children. The Peg Perego Polaris Outlaw is best suited for young children from the age of 3 due to the very limited top speed which won’t excite older thrill-seekers. The first electric quad on our list today is the stylish Polaris Outlaw by Peg Perego. 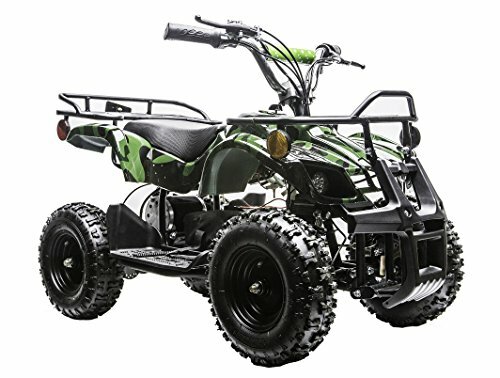 This is a simple, no-hassle kind of electric ATV that will be a perfect fit for young kids getting their first ever ATV. 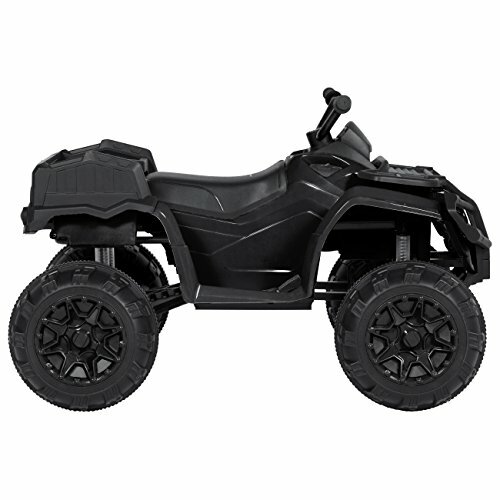 The Polaris Outlaw is by far the lightest kids ATV on this list, weighing only 42 pounds. It is relatively lightweight but can still support a max load of 85 pounds. This makes it a great fit for virtually any child aged 3 to 8. The Polaris Outlaw doesn’t feature a manual control throttle like other ATVs. It was designed with simplicity in mind. As a result, there are only two speeds – 2.5 miles per hour and 5mph. This also includes the ability to go in reverse, which will definitely come in handy in awkward situations at parks or woods. The aesthetic design of the Polaris Outlaw is about as cool as the name it has. The citrus yellow look is easy on the eyes but also gives kids the impression of something that is lightning fast, even if it only goes up to 5mph. 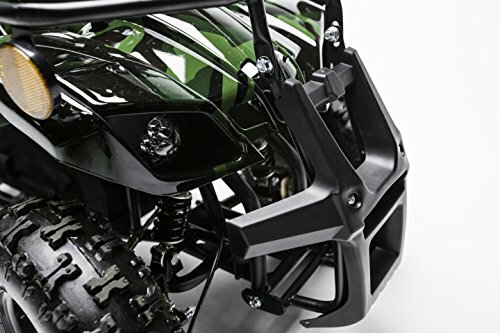 The frame of the body is shaped just like actual ATVs for adults giving it a realistic look. What really impressed me with the Polaris Outlaw were the seat and the wheels. The driver’s seat is realistically designed and has an ergonomic shape that matches actual seats on normal sized ATVs. This not only adds to the overall realism of this electric quad but it also makes it more comfortable. 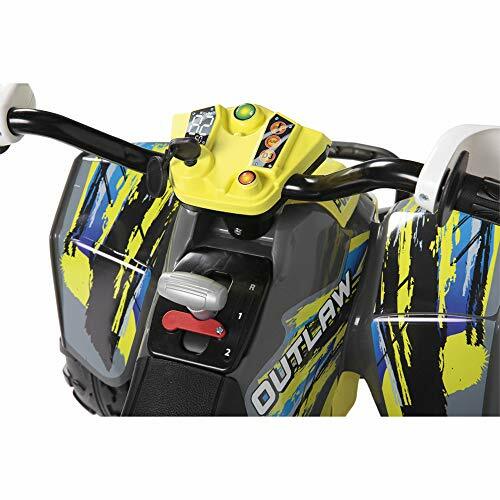 Kids can sit and drive in the Polaris Outlaw for longer periods of time without feeling any fatigue thanks to this. The wheels are also surprisingly large and are roughly the same size as the wheels on the rest of the electric ATVs we’ll be looking at later. This is especially impressive considering how much smaller and more lightweight the Polaris Outlaw is compared to other electric four-wheelers. 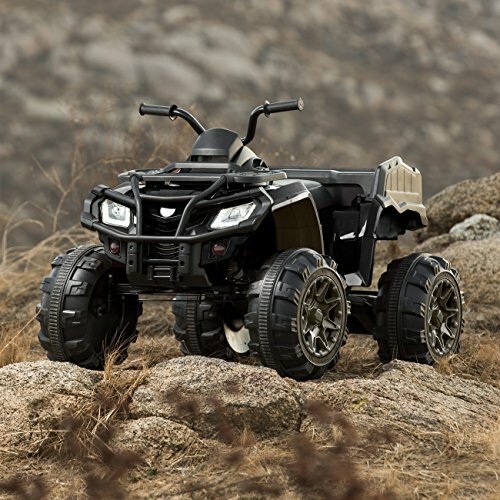 Since we’re talking about ATVs, one would expect the Polaris Outlaw to be able to handle terrains beyond sidewalks or driveways. There’s no doubt in my mind that this electric quad handles well on dry or wet grass as well as mountain trails. You could even take this to the beach with your kids and it will handle sand decently too. You’ll have to be mindful about cleaning the tires afterwards, and it does noticeably lose some of its traction on the beach but it will still function. Overall, the riding experience of the Polaris Outlaw is very good. Taking into account its light frame, the relatively large wheels, and the ergonomic seat, it remains comfortable and reliable on most surfaces. You will want your kids to avoid icy roads with this kids’ ATV. Deep mud pools also tend to dampen the experience. Other than that, everything else is on the table. It doesn’t have the most responsive steering, but it’s still pretty solid. A feature like this doesn’t matter too much with a low max speed of 5mph, but one should still expect to not be able to make any sharp or wide turns with this kids’ quad. The battery installed in the Polaris Outlaw is a standard 12 volt. That means you’ll get roughly one hour of use and it will take several hours to recharge before each successive ride. 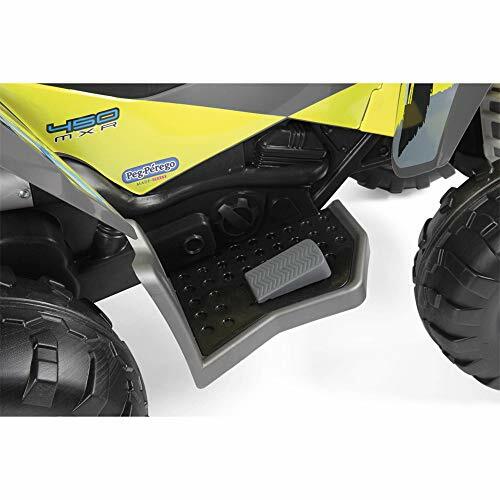 A common trend I’ve noticed among affordable electric ATVs for kids is that the battery is usually the weakest aspect of the product. The Polaris Outlaw is no exception to this. As long as you or your child takes the time to plug it in every night then it won’t be much of an issue. Still, it can be frustrating knowing that 10 hours of charge time only gives one hour of play time at the most. 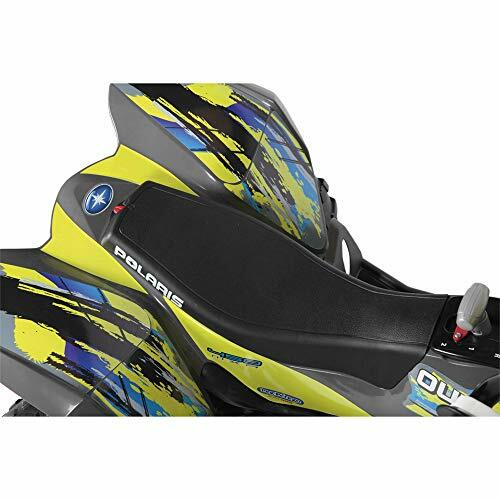 My final thoughts are that overall the Polaris Outlaw is an excellent choice for 3 to 5-year-olds but will also be very well suited to slightly older children too. I love how they designed the frame and the seat. The fact that they managed to put wheels this large on a lightweight vehicle is impressive and makes this vehicle stand out. While the battery may be your typical weak point, this is overshadowed by how much it does right. That is why I consider this one of the best electric four wheelers for kids. 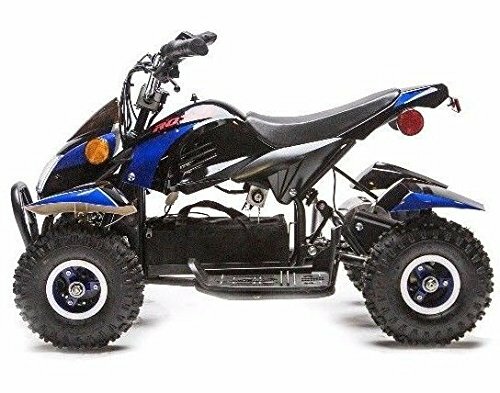 The Razor Dirt Quad is very similar to a grown-up’s ATV and is best suited for older kids who can handle the weight and top speed of this four-wheeler. Miniature electric off-road dirt quad with authentic quad geometry.Average battery life: 250 charge/discharge cycles.To ensure long battery life, do not store the battery in temperatures above 75° or below -10° F.
The next kids ATV I’ll be talking about looks a lot different than the previous one. While the core functions of off-road movement may be the same, this is definitely designed for somewhat older audiences. Let’s start getting into the Razor Dirt Quad. Razor recommends that the Dirt Quad is best suited to ages eight and up. This is made clear when you take a look at its specs. 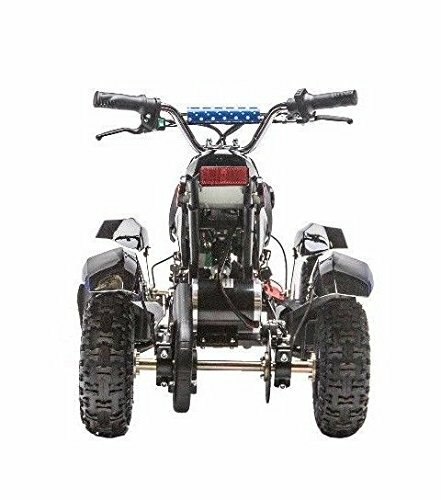 The Dirt Quad weighs about 80 pounds and has a load capacity of around 120 pounds. That means that even lightweight adults could ride this electric quad. More evidence that this is an ATV for older kids is the max speed of 10 miles per hour. This may not sound very fast for an adult but it is probably too fast for a four or five-year-old. This is the main reason why Razor recommends that ages eight and up use this quad vehicle. What I really like about the Razor Dirt Quad isn’t just its decent speeds but its build quality. The materials used in this kids ATV are actually pretty high quality. The gears and axles are all stainless steel and they look and feel very firm and strong. This is the kind of ATV you should get if you want something that is going to last for years and years. 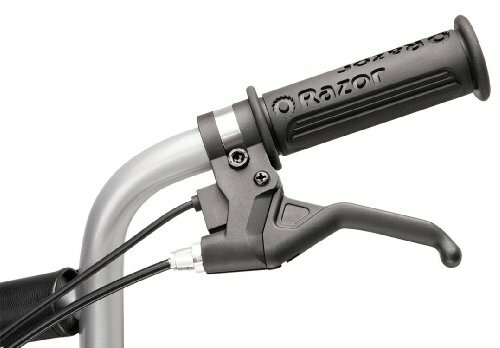 Another great feature that adds to its longevity is the adjustable handlebars. As your kid grows and ages, you can adjust the height of the handlebars so that your boy or girl will always have a comfortable fit that suits their size. The Razor Dirt Quad also uses a dual battery system. Two 12 volt batteries are simultaneously used to give a total output of 24 volts. This roughly adds up to 40 minutes of use at max speed. Considering the price range you normally find the Dirt Quad in, this is actually a pretty solid amount of power. 40 minutes of 10 miles per hour is a lot better than 40 of only five miles of range. While this electric quad weighs 80 pounds, the wheels are surprisingly a little on the small side. 13-inch pneumatic tires are used and have been designed with very good grooves to provide the grip and traction needed on various surfaces. 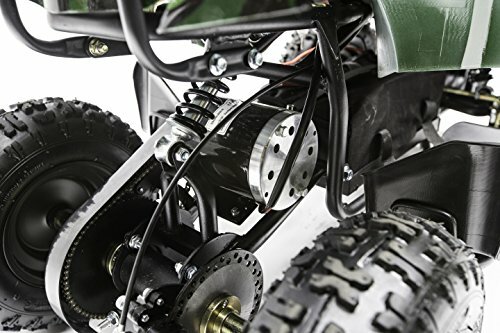 The Dirt Quad also has a throttle system just like actual ATVs for adults. The speed is controlled by adjusting the throttle device on the right side of the handlebar. This level of realism is another feature I really found impressive with the Dirt Quad, and kids will love it too. It may be more complicated than a single fixed speed but it is actually quite easy for kids to learn and get used to. The Dirt Quad’s throttle is easy to adjust and is very responsive. Kids will have no trouble getting the exact speed they want, whether that’s 5mph or 8.5mph. The steering is also very responsive. Whether its grass, asphalt or dirt, the smaller wheels are able to make very specific turns at any speed. If you have a child who wants to zig and zag with decent precision, then the Razor Dirt Quad will easily satisfy that need. 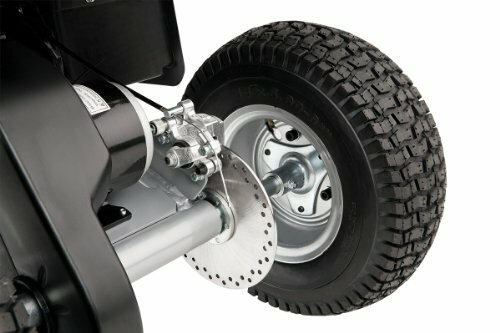 The disc brake system is a standard safety feature that you see on a lot of vehicles, be they electric scooters or standard bikes. It works very nicely at speeds well above 10mph, and they work very well here too. Whether your child is going 6mph on wet grass or 10mph on muddy mountain trails, they will always kick in. The only real complaint I have about the Dirt Quad is that it isn’t as comfortable as I’d prefer it to be. The riding experience is very smooth thanks to great brakes and steering but the seat is a little too flat. It isn’t as comfy as it easily could have been. The little footrests on either side also seem to be a bit cramped and some kids may outgrow those faster than others. 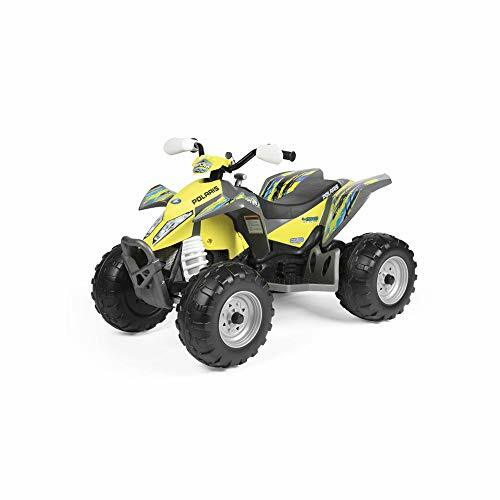 I would highly recommend the Razor Dirt Quad to boys and girls from 8 to 10 years old who want a moderately fast ATV that can do very smooth turns that keep you firm and stable. This is a well-crafted machine made from metals that will last years and years. You may find yourself surprised at how long it will take for your kids to outgrow this thing. Good wheels, great steering, and great longevity are why I consider the Razor Dirt Quad one of the best electric ATVs for kids. The Rosso Motors 500w looks realistic, goes fast, impressive power and handles a wide range of terrain. The next electric quad I have for you today is a more technical machine that has more power and more speed than the last two on this list. While it may be designed for ages three to eight, it could be just the machine you want to buy if you want something that will last for those five to six years. This is the Rosso Motors 500w ATV Quad. 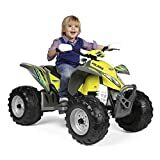 What I usually like about Rosso Motors’ ATVs for kids is that they tend to look very similar to the real thing, except minimized down to the size that fits three to eight-year-olds. I’m not sure if this applies to other people but the first thing I notice when I look at this quad vehicle is the underside. You can see all of the gears and components just lying out there, just like with a real adult-sized ATV. This is the kind of attention to detail that really made the design stand out. Let’s start looking at the specifications. The 500w Quad is heavier than it looks, weighing in at 90 pounds. This could very well be a testament to the high-quality components used in its construction but we’ll get to that later. The 500w Quad is capable of a max speed of 13 miles per hour, making it tied for the fastest kids ATV on this list. If this speed sounds too fast for a four-year-old then you don’t need to fret. 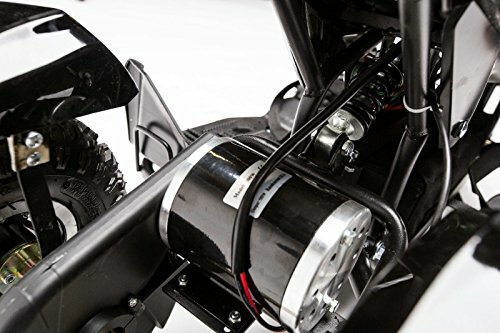 The 500w Quad comes with three adjustable max speeds so you can easily set a limit on how fast it will ride. The two lower settings are around 3mph and 6mph respectively, which will be great for the youngest of riders or those who are just learning how to ride. 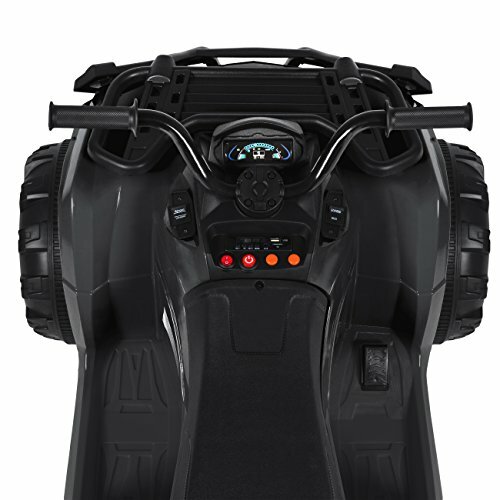 One thing I really liked about the Polaris Outlaw is also featured in this Rosso Motors unit: the ergonomic seat. Just like actual ATVs, this 500w Quad has a sliding seat with a slight incline to allow for a more relaxed and natural position. 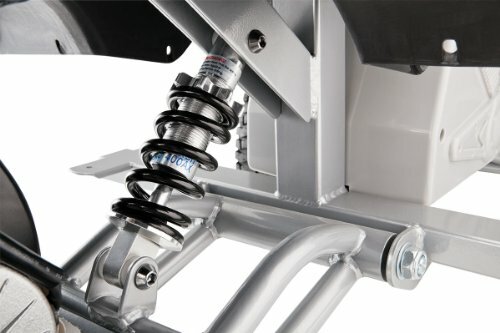 It makes it easier for the body to shift when doing turns and only adds to the overall stability of the riding experience. The wheels of the 500w Quad are without a doubt very reliable. The disc brake system is actually installed in the front wheels as well as the back. This makes braking at 13mph feel smooth yet also instantaneous. 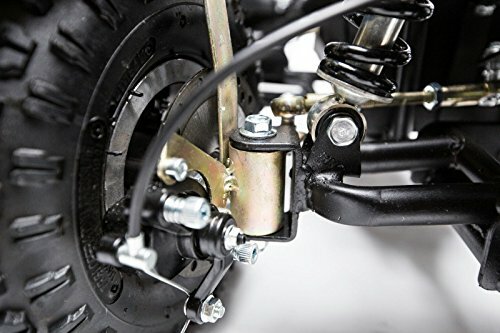 Additionally, the axles are assembled with a variety of parts including screws and nuts to give this kids’ ATV extra reinforcement and longevity. The rubber wheels may be a little smaller than ones I’ve previously discussed, but they are thick and hard. This gives them very good traction on wet surfaces. This quad undoubtedly performs better in snow than other vehicles on the list, which makes it a great choice for anyone who is planning on doing a lot of outdoors activities during winter. So if you live in a cold climate that has long winters, your kids will still be able to get some outdoors fun from this machine. The headlight is another great bonus feature that adds to the Rosso Motors’ realism and is bright enough to help see a few feet ahead of the vehicle during the evening. It isn’t too bright so you don’t have to worry about it draining the battery. Speaking of which, the 36V battery allows the 500w Quad to last a decent amount of time. You can get over an hour at max speed on a full charge and the charge time is only about six hours, half the time of many other electric four-wheelers. 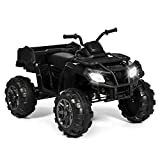 If you want something that looks realistic, can go fast, has great control in snow and has a pretty solid battery output then the Rosso Motors 500w Quad 4 Wheeler will be a great buy for you. The Best Choice Kart has lots of extra features that make this a great toy for kids that don’t mind a slow ride. Features working LED headlights, horn sounds, and a storage basket perfect for hauling toys! The Best Choice ATV made my list almost entirely because of how many extra features and functions it has. It may not be the fastest or the most powerful kids ATV on this list, but in my opinion there will always be something to be said for just being loaded to the brim with extra functionality. If you want something for your child that can do a lot more than just drive in dirt or snow then this will probably be the kids ATV you’ll want to get. 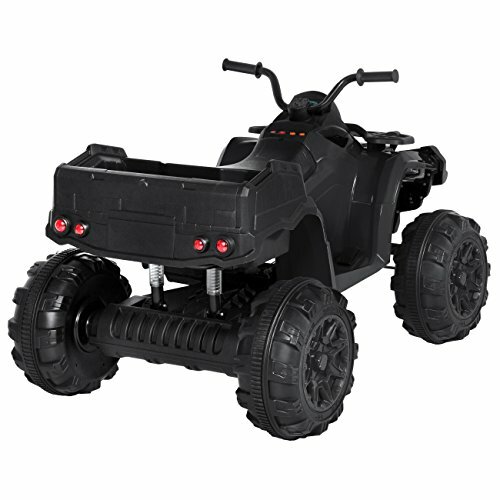 The Best Products kids ATV weighs about 52 pounds. It has a max load capacity of about 100 to 110 pounds, making it designed for audiences slightly smaller or younger than average. It only has a max speed of 4 miles per hour so this is not the electric four-wheeler to get if your boy or girl has a serious need for speed. As a matter of fact, the Best Choice ATV has the worst wheels out of all the products on this list. Don’t get me wrong, they’re not bad but they are made out of plastic instead of rubber. They work well on grass, gravel and dirt trails but they won’t have the same kind of steering control or comfort stability on snow, mud, or sand. 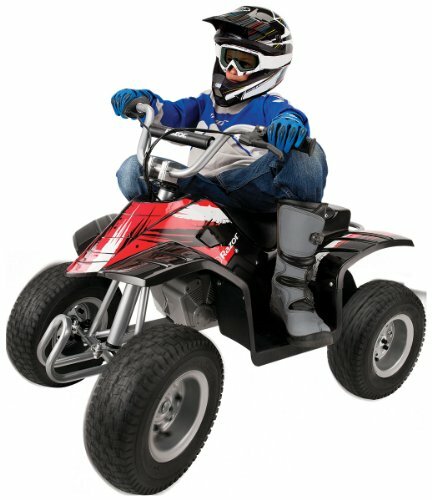 So why do I recommend this kids ATV? Because it can do so many things that most other kids ATVs just can’t. For one thing, the Best Choice ATV has a storage trunk. This gives kids the ability to put their toys in the back and carry them around with them. Giving kids the option to take their favorite toys with them outside will only make them want to stay outdoors even longer, which could very well be a good thing depending on how long you want them outside. The next feature I want to talk about is the built-in mp3 player. You heard me correctly. The Best Choice ATV has a USB slot right on the dashboard where you can load up mp3 files. Your kid or kids can cruise throughout the neighborhood listening to their favorite music as if they were driving an actual car with a CD player or a radio. This kids ATV also comes with headlights but they are actually very powerful on this model. Two big and bright LEDs are in the front of the ATV and will work very effectively at nighttime. This Best Choice ATV model comes in four different colors. While black, pink and green look okay I would highly recommend that you go for red if you can. It is a far more vibrant and attractive look and will only add to the enjoyment of any driver. While it may not have the all-terrain driving capabilities of some other kids ATVs, it’s still a great pick that your kids will love using. If you know that your child cares more about these extra features than simply going fast, then Best Choice is probably going to be your best choice. The Rosso Motors 800w Quad is the real deal with one of the strongest motors and highest quality materials of any kids quad. DURABLE & VERSATILE - All-terrain rubber tires and a shock absorbent suspension package. Front and back rack for putting things. The final electric four-wheeler on my list today is going to come off as a bit of a repeat. This is essentially an upgraded version of the 500w Quad 4 wheeler we looked at before. Rosso Motors is arguably the best manufacturer when it comes to kids ATVs, which is why I decided to give them two spots on this list. When looking at the specs, this Quad wheeler seems pretty similar to the other Rosso Motors ATV. It weighs 110 pounds, has a top speed of 13 miles per hour, and has three adjustable speed settings and disc brakes installed in the rear and front. Just about everything that was in the 500w Quad is in this 800w Quad. The biggest differences were noticeable when I actually started examining the ATV itself. The gears, axles, handlebars and wheels seem pretty much identical. But the frame itself is a little different. It has more of a square shaped than the swerving design used in the 500w, if that description makes sense. The 800w Quad actually looks more realistic and has a more accurate design when compared to how real life ATVs look. One difference I eventually spotted was that the seats are different too. They’re not just shaped differently but made out of different materials. 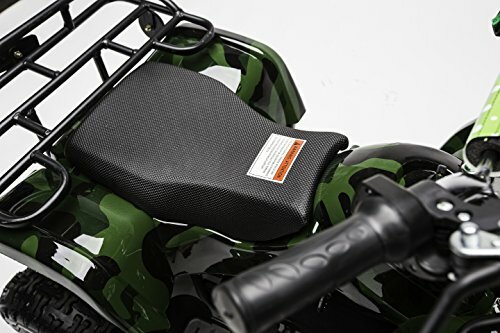 The seat on the 800w Quad is actually softer and more comfortable. It’s made out of a certain mesh material that provides comfort as well as enough grip to keep kids nicely planted. In short, driving at max speed is a little safer and more stable on this kids ATV. Driving on various terrain seems to be just as exceptional as it was before. The rubber wheels are very high quality and can handle anything from gravel, sand, snow, wet grass, mud and dirt trails. Steering and turning is just as responsive as with the 500w, and the dual disc brake system in the front and rear tires works splendidly. Arguably the biggest modification made is the upgrade to the actual 800w motor. It doesn’t improve the max speed but it has made acceleration a little faster. It also has a slightly better range and battery life so you can use this thing from 10 to 13 miles per hour for a little longer, despite needing the same amount of time to charge. This is undoubtedly the most efficient kids ATV on my list as far as energy consumption is concerned. There’s not much more for me to say about this unit. This is the same great Rosso Motors ATV from before, but slightly better. The seat is comfier, the battery life is better, the frame is somehow even more realistic looking than before. As far as simple speed, control and safety is concerned, this may very well be the ultimate electric four-wheeler for kids. You’ll have to pay more than usual for this model, but if you want the absolute best, this one is definitely my top recommendation. Thanks for reading my overview of the best electric ATVs for kids. Now that’s you’ve read about all of them, consider the age of the kid or kids you’re buying it for and take that into consideration when making your decision. These are built to last, so they could also be hand-me-downs if you have more than one child if your family. Every single one of these quad wheelers had something unique worth noting. 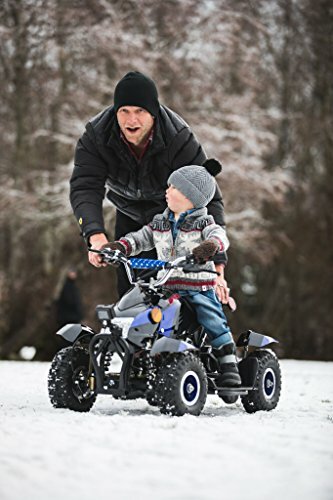 I hope that you’ve learned something about what makes electric ATVs such a great gift for kids and that you’ll make the right purchase to give your children an amazing toy that can give them years of fun and adventure. Welcome to Motorized Rides – a site dedicated to helping you find detailed and unbiased reviews and advice! Edwin is the man behind this website who has an inexplicable love for gadgets, especially personal mobility devices. When he isn't cruising around the city on one of his electric rides, Edwin loves to spend time with his family and travel. Subscribe to our newsletter to receive the latest news and product announcements. No spam.